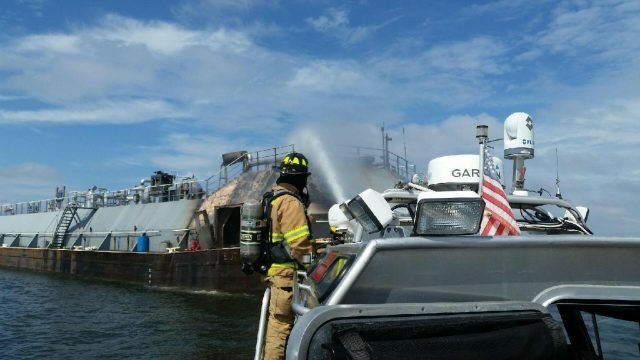 On August 3, a 195 foot long barge caught fire on the Intracoastal Waterway in the Mississippi Sound. The barge was under tow by the 23 meter long towboat Kathryn T. Devall carrying some 2500 pounds of anhydrous ammonia and 800 gallons of diesel fuel. Authorities in Gulfport, Mississippi were alerted and firefighters were able to douse the fire. No reports of injuries to the 4 crew on board. The Kathryn T. Devall and the barge were not in danger of sinking, but the vessels required to be towed to shore. An environmental team was dispatched to help with cleanup.